Players: A tiny Italian lady ‘of a certain age’ and a much younger couple speaking (when just between themselves) in an Eastern European language. 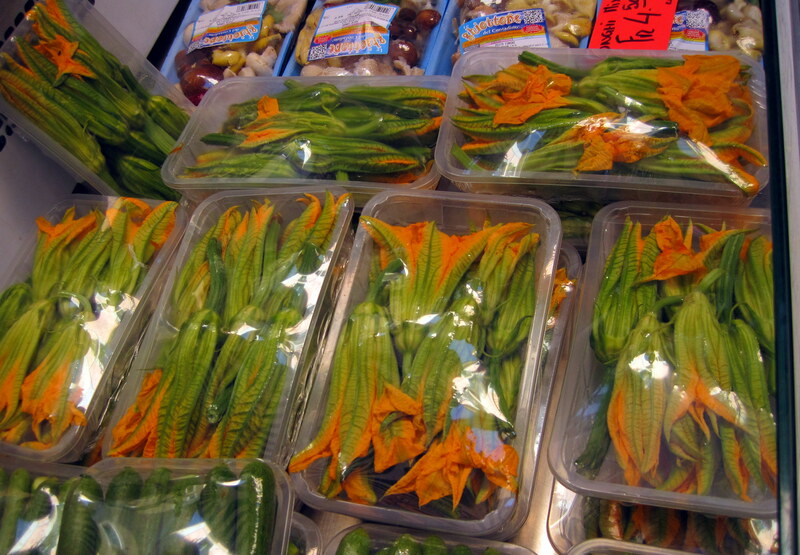 As the lovely little lady amassed her purchases, which included a giant box of zucchini flowers, the Eastern Europeans asked her what she did with them. Kindly, she explained her flour (flouring the flower) procedure and deep frying, as they looked on uncertainly, clearly not doing a lot frying in their house. Having left before the couple, myMEGusta does not know if they are going to try it. These gorgeous yellow blossoms are an expensive seasonal treat, and a great way for anyone to literally nip zucchinis in the bud rather than wait for a bumper crop of squash with not enough friends to farm them out to. And, they are a nice profit center for our farmers (who can also be plagued by a deluge of squashes beyond what they can sell). 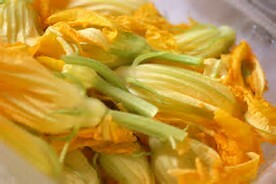 Interestingly, the male flower is the one found in US markets, while in Europe, you see both the male and the female, with a baby zucchini attached, perhaps because there is such a strong market for them there. 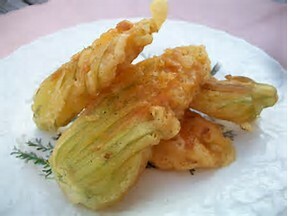 The lady’s recipe is classic, and a tempura style batter also works great, although it’s a lot more work. 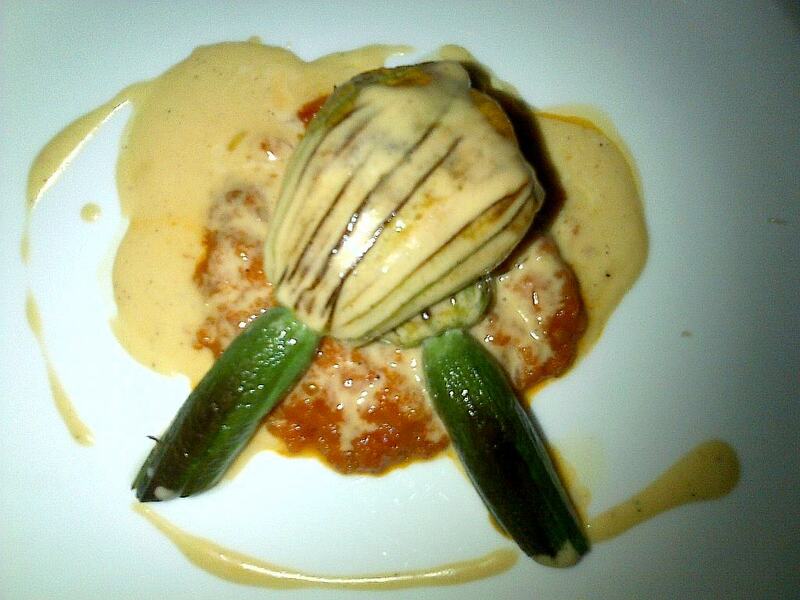 On a recent trip to Lugano, Switzerland, the heart of Italian Swiss cooking, myMEGusta sampled them at the Verandah Restaurant in the Hotel Splendide: stuffed with chopped wild mushrooms, pan seared rather than fried, then served over a tomato sauce with a garnish of cheese sauce. It was awesome, and less guilt-inducing than the deep fried specimens (other than the delish cheese sauce). What a treat that was after ogling the flowers and fresh wild mushrooms in the market that morning! One of my favorite guilty pleasures!